AR (Augmented Reality) and VR (Virtual Reality), both technologies and terms come up with a great shake in the online marketplace. In order to offer the most phenomenal experience to the audience/users, each Mobile App Development Company is thinking about putting the best techniques in action, by one or other way. The Computer generated sensory data or information in terms of graphics, video, sound or location are now not that enough to interact with the real-time world? However, the augmentation of real-time elements can do wonders and will be much more interactive. 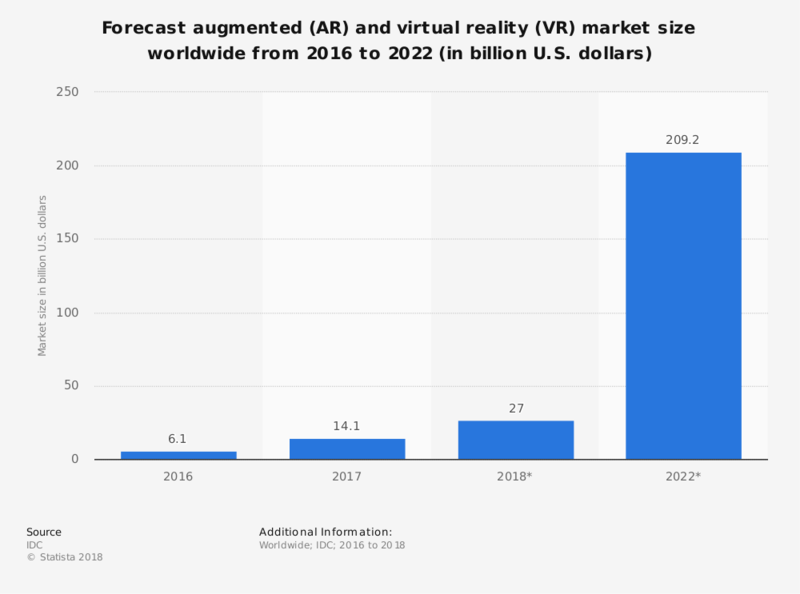 The statistic shows the forecast for the global augmented and virtual reality market size for 2016, 2017, 2018 and 2022. By 2022, the Augmented Reality (AR) and Virtual Reality (VR) market is expected to reach a market size of 209.2 billion US Dollars. AR-based App Development is based on the integration of the internet and steady products to enhance the experience. When someone adopts AR to the business, it offers the optimum UX and reinvents the style that people usually aware of. A study says that more than 81% of people utilize the smartphone for online shopping. Hence, if online businesses start using the latest technology to attract visitors, it will help them to leave a powerful impact. Also, it will help them to convert visitors into vendee. Likewise, the unthinkable applications for a number of purposes, are possible using AR technology. Now is the time for technologies such as augmented reality, virtual reality, Internet of Things, etc. Mobile Apps are ruling technological trends and somehow controlling our life. Plenty of industries are investing in Mobile App Development to increase online customer base or to survive in this virtual marketplace or for other beneficiary purposes. Now the question is how to stand out and create a strong hold over the worldwide customer base, one way is, if the Mobile App can be nicely configured with Augmented Reality, it will be more interactive and informative. Augmented reality (AR) is an interactive experience of a real-world environment where the objects that reside in the real-world are "augmented" by computer-generated perceptual information, sometimes across multiple sensory modalities, including visual, auditory, haptic, somatosensory, and olfactory. The face of entertainment started changing because of augmented reality. Before anything, ask yourself what is the future of entertainment? Majority of them will say the fun experiences we have on our smartphone (Movies, Games, and Music etc.) will become more realistic, more interactive and more immersive than ever before. Introduction of the Augmented Reality (AR Technology) is changing the way we've used mobile apps for entertainment. From small-scale App development Companies to giants like Google - the adoption of AR for entertainment everywhere. We all are very well aware of the success story of Pokémon GO. Today, it is not just a fantastical concept, Augmented Reality Games are becoming a front-runner of the gaming industry. It enables users to fight aliens, and defend the kingdoms in the real world, and all they need is AR-enabled smartphone or console. With AR, ‘listing to music’ experience is also evolved. The earphones create an augmented layer on the top of the real sound to enhance the listening experience. Additionally, apart from musical notations, AR could give users a much more comprehensive concert feel. AR-based apps for Android and iOS got a quick boost and popularity among the users. Whether one is looking for the complete fantasy out of a fun experience, you will probably get it via a simple app that’s to be installed on your smartphone. Still, many doors are open for AR to wow your users, Are you ready to dive into the world of immersive tech? Augmented Reality Apps are adding interactivity and opening additional ways of learning to any classroom or solo learning experience. The complex information or theories can be explained to students in a better way, it also builds engagement and interest. Research reveals that visual learning is much more effective rather than words. AR can be synchronized with the academic programs to make students learn and remember the syllabus easily. AR in allows you to see in the real world with extra information presented digitally. It provides a new method of innovative and immersive learning through visualization and interaction which can strongly benefit apprentice with the understanding and also have a large influence among online learning platforms and MOOC. It uses GPS locations to trigger the augmented information, besides others overlay AR over an image, word or barcode. It allows learners to view 2D and 3D models from all angles in reality. Few AR apps encrust exciting digitalised content on top of real things with the help of smartphone camera. If you are the person with the vision to build a smart learning app, let's have a cup of coffee together. As population count is crossing the limits, healthcare services across the world are feeling ever-increasing pressure. Coupled with rising expectations regarding the quality of healthcare provision, the increased demands seeking resources stretched and cost skyrocketed. Therapists to cure various diseases are already using AR and VR technologies. They take the patient on tour with live effects. For example, a patient is having any phobia related to height, crowd, or stage fear are provided with the visual environment to make them overcome the phobia in the safest way. AR can do much more than helping win over any phobia, the results always depend on how qualified the AR App Developer you hire for the right implementation. When it comes to some critical case study AR can help to discuss the case with fellow doctors or relatives. For patients, AR can significantly improve the quality of treatment. Accidents during surgeries can be reduced by keeping the most important information in front. Where previously surgeries required monitors in the OT to display vital statistics and images being sent by an endoscopic camera, Thanks to AR, a surgeon can now wear smart glasses during the procedure and stay focused. Overall, AR is minimizing mistakes and reducing the requirement to multitask more than is perhaps necessary. As the AR continuously pushing the boundaries of the technology and with the right innovative partners in the healthcare space, we expect to see more interesting AR use cases that will transform the healthcare industry. Although the public may not be entirely ready for AR, automobile manufacturers are eager to put it to use because of the benefits it contributes to the production. From design to production and sales, AR can be used more widely and will create a powerful impact. A while back, BMW rolled out its playful take on Augmented Reality, and now the automaker is bringing immersive computing whimsy to iOS directly. Using Apple’s ARKit, BMW-i visualizer app is allowing us to customize and select a life-sized version of BMW i3, i3s and i8 car while in any location. But beyond just giving you the ability to change the style of rims and colour of cars, the app also allows you to step inside a vehicle. The production engineer can view the detailed virtual reproduction of the automobile chassis as well as the interior. Clearly, there are already multiple domains where AR can streamline the production process and reduce the cost. AR glasses developed by Mitsubishi help the maintenance workers to have always a guiding hand while the routine maintenance of manufacturing equipment. Augmented Reality and Mixed Reality decreases the efforts of real estate businessmen, some of them already made use of AR technology in several ways, from refreshing catalogues to an interactive demonstration on a mobile screen. AR in real estate is already providing serious business opportunities. It has a value similar to effective marketing methods, also, a tool to encourage buyers into a conversation and purchases. The Augmented effects for all the running sights help customers to decide the aspects and prospects. The 360-degree view of any location gives a realistic vision. Augmented Reality visualization works with both photos and videos with a text description. And the more complex an object is the better assistance AR presentation offers, which is easy to understand. What we see right now, surrounding us in its most natural form and Augmented Reality is exactly the opposite of the same. The discussed industry sectors are just potential examples that how the AR app can be related to the beneficiary purposes. AS basks in a great interest among smartphone owners and the optimistic forecast for a great future. As you see, it already has proven benefits, if you’re a person who has a great vision for your business then, you should probably think about how AR based apps can help you. Kunsh Technologies the leading Mobile App Development Company, we work with modern technologies and helping various industries with the latest technology trends. It is a mixture of both Digital and the real world that result in inception to the new world. Augmented Reality App represents a changed view of reality by augmenting the elements or components in context to the environment. Sooner or later AR will be part of each app of your smartphone, and integration of this technology as early as possible will surely help you create a huge customer base.